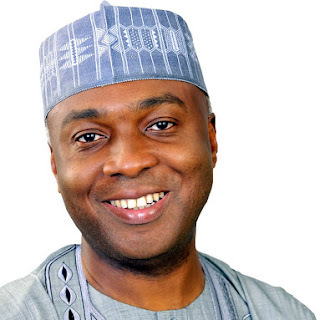 Senate President, Bukola Saraki, on Tuesday, 2nd January, 2017, kicked-off the #MadeInNigeria Campaign via social media. 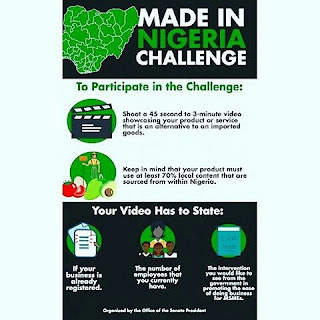 The aim of this campaign is to promote and sustain the Made in Nigeria products and also to create more products that will serve as alternatives to imported goods in the country. This campaign is organised to showcase everyday products that are used by Nigerians and produced by Nigerians locally that serves as an alternative to imported products. The next few weeks, we hope to identify products and ideas that can be matched with investors and government agencies. To wrap up the Challenge, in March, we will be inviting some of the finalist to a Made In Nigeria Roundtable at the Senate. This Roundtable will allow us, legislators, Government Agencies, business owners, and everyday Nigerian consumers to review and update the report of NASSBER, the National Assembly Business Environment Roundtable, which was held in 2016 to improve the ease of doing business in the country. As part of Senate's oversight of government agencies, we will also use the opportunity to get feed back on the Public Procurement Act passed by Senate in 2016 which mandates government agencies to give preference to local manufacturers in Procurement of goods and services. Good luck to all the participants. Be sure to use the hashtag #MadeInNigeria in all your submitted videos.